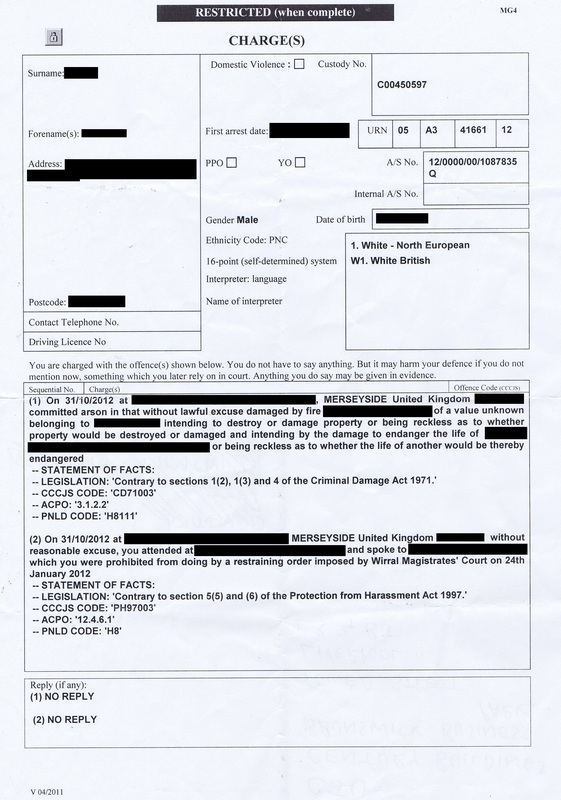 It’s nice to know that even during this Police and Crime Commissioner election the police staff are managing to leak a custody record to a member of the media (please note I’ve black boxed out most of it as proceedings are “active”) in relation to a charge of arson and breach of a restraining order on 31st October 2012. Wasn’t that the whole sort of thing the whole Leveson inquiry was supposed to address? However the recently resigned Norman Bettison (infamous down to his role in Hillsborough) is a former Chief Constable of Merseyside Police, do you expect them to be following procedure or indulging in coverups? I don’t see the point in making a complaint about this as invariably complaints about the police result in a whitewash. They usually don’t want to know about their own mistakes do they? One day, maybe the police will stop leaking like a sieve, but I won’t hold my breath until it happens…. And how is it ‘in the public interest’ for judges to withold information from the public? – they did it with Hillsborough (or was that the police?) but I was also thinking this happened with the Columbine Massacre. Witholding documents and placing some kind of 20 year restriction (I don’t know the legal terminology) on access to testimonies and certain documents etc… I just can’t understand it al all. It’s a disgrace. It’s widely believed that the police gave false information to a news agency (who then gave it to the media) and politicians as part of the cover up surrounding Hillsborough. For further information see http://hillsborough.independent.gov.uk/ . I have no insight to give as to whether judge/s in this matter withheld information from the public. The American justice system (Columbine etc) is different to the British justice system. There are various ways that evidence or witnesses in a court proceedings can be kept out of the public domain, off the top of my head, two would be public interest immunity and videolink for witnesses that can’t turn up due to threats made against them… there are also provisions to not hold proceedings openly in public, in practice though most cases (both criminal and civil) are usually poorly attended by both the press and public.